The Slinky (toy) has helped MACH Acoustics visualise sound which, ultimately, has enabled us to explain why one window type behaves differently to another. 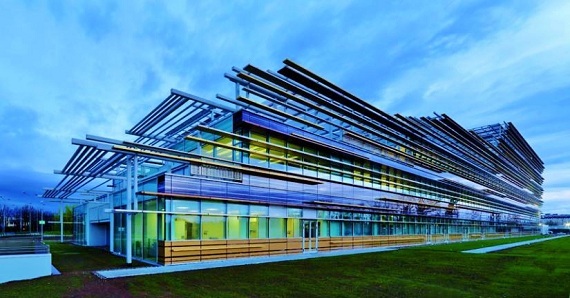 One of the reasons why we see so few genuinely low carbon buildings is because hugely complex acoustics are involved in creating these buildings. In addition, design teams do not instinctively bring acoustics into the mix when planning ventilation and it is an area often overlooked. However, getting to grips with this element of building design is critical. At MACH we have used FDTD mathematics to create some incredible software that enables us to visualise sound. We believe that being able to visualise sound will facilitate better understanding of the complexities associated with the acoustic design of say, a window. More importantly however, design teams will intuitively grasp the importance of key design changes, leading to the whole team providing better, more sustainable buildings. Now a fairly cool ‘retro’ toy, the Slinky has been our inspiration in visualising sound waves. One of the problems with the above model is that there are few Slinkies involved and so information is minimal. It isn’t viable to tie hundreds of these units together to provide a more representative way in which sound travels around the ventilation systems of low carbon buildings - so we turned to mathematics to create a more representative wave model. The image above shows how this model has been formed. 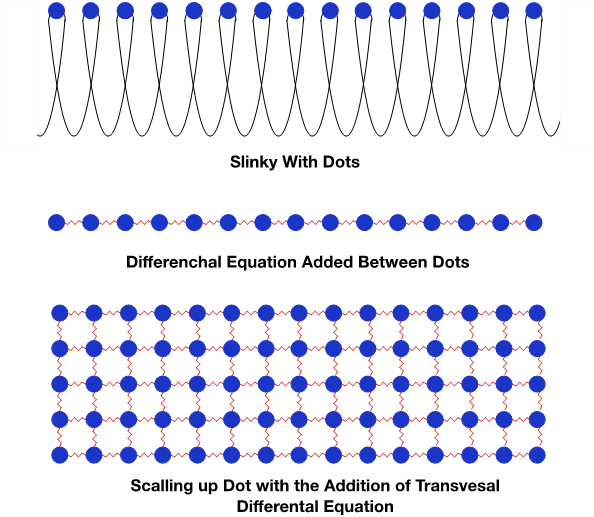 The dots represent the movement along the Slinky that have been tied together with a string of differential equations, (see red connection points). This allows for a similar Slinky model to be formed. However, this is still a 1D model as the dots only move in a line, and the image is pixelated. So we have added transversal differential equations between each of the cells/dots, and increased the number of cells by a factor of around 1,000. The results are amazing. The above model clearly shows the propagation of sound in 2D (please note we also now have a 3D model) and the effects of this wave reflecting off a structure. The most important aspect of this model is that it demonstrates how sound bends around this object. This bending, known as diffraction, is the reason why we often hear a sound source that we cannot see. Diffraction is possibly the most critical component in understanding the passage of sound through open windows. Thanks to the Slinky, we are able to illustrate how sound behaves, and show you how different window types effect the acoustic performance of a building. Demonstrating why one window type behaves differently to another is a giant step towards understanding the powerful link between acoustics and low carbon building design. Maths, physics and playing with toys give us all the answers - more beautiful buildings await.